I all ready have QS4s for my surrounds, and just ordered a pair of M3s to try out. Assuming the M3s workout, I would need to change my center to match timber. I have seen a few bad comments on the VP-150, due to the fact the tweeters are so far apart. Apparently creating a combing effect, leading to uneven dispersion. That being said, I see it no difference the LR signals producing the same high to center an image. Also, I have not seen another center channel speaker do this. Any current owners of the VP150 able to comment? I do like the idea of the wider sound stage of the VP150. Please note the LR speakers are about 8' apart. Or is the VP100 good enough? I dont have a 150 but i have a 100 and i find it to be a bit weak. I had it in my HT but built my own center using axiom drivers and moved the 100 to the bedroom and i find i have to increase its level and still find it lacking. Most with the 150 have moved to the 160 which is what i modeled my center after and it works fantastic. So if its in the cards get the 160. I went from a 100 to a 160 with MY M22s flanking the center. I can't comment on the 100 because I've never heard it. Stay away from the 150. What a POS! I sold it to my buddy after living with it for 11 years. I just came back from watching movies at his place and was reminded of how terrible it is. I replaced it with the 160v4 and it is absolutely bliss! Here's my review. Trust me; it's awesome! Well, I have the 150 sitting between a pair of M22's. I honestly never had any problems with it. I sit about 8ft away from it and usually sit within the same 3-4ft area on my couch. Now, I did just order a 160 but that wasn't really because I was dissatisfied with the 150. My main move is going from EP500's to 600's and getting them in a custom wood finish. So doing all the other speakers first including M22 to M5's. I decided to upgrade to the 600 only because I've heard so much good about it. Once I get it I'll let you know how much of a diff I hear. It will be about a month until they are shipped...that's my best guess for now. I had the 150v2 as I said in my review of the 160v4. Maybe Daniel if you have the 150v4 it's better...I don't know. I sat 8 feet away from it and 14 feet away from it - it didn't make any difference. The 160v4 (and EP800v4) changed my life. I haven't had to touch the center gain trim since I dialed it in over 3 months ago now. I was constantly tweaking the gain into the 150v2 and never was satisfied. I want to thank everyone for their replies. The M3s are arriving Wednesday, so I do have lots of time to hear more feedback on the Axiom centers. Minus the hate campaign by what seems like the same people, it is really hard to find reviews on Axiom products in other forums. I am currently using a set of B&W DM600 S3s and a LCR60 S3 center. Hind site being 20/20 I really should have tried the Axiom center first. This has always been the sticking point for me were an under performing center speaker can hurt the whole system for HT. Worst case I will at least get to demo a set of Axiom front speakers, just out return shipping. If I am lucky maybe the M3 match well to the B&W LCR60 and I can keep them and save up for VP160. Hopefully a few more people might be able to comment on the VP-100 and VP-150 before then. I was just hoping to upgrade my fronts on budget in one step. Thanks, Mojo, I did read your review and a few others which is kind of what spurred on this concern. I have a VP150 with M80's, dual EP350's and QS8's and my room is 25ft long by 18ft wide. I have never heard the VP100, but was at Axiom for the 30th Anniversary bash when the VP180 was available for testing. I have also never heard the VP160. ...I also wont rant or engage in any "hate campaign" as you call it. I find the VP150 to be fairly good in my setup. I think the VP180 will ultimately be were I end up, but as this is a hobby for me, other things take precedent. I am not one to worry about timber matching, as I have rotated many different speaker through my system over the years. 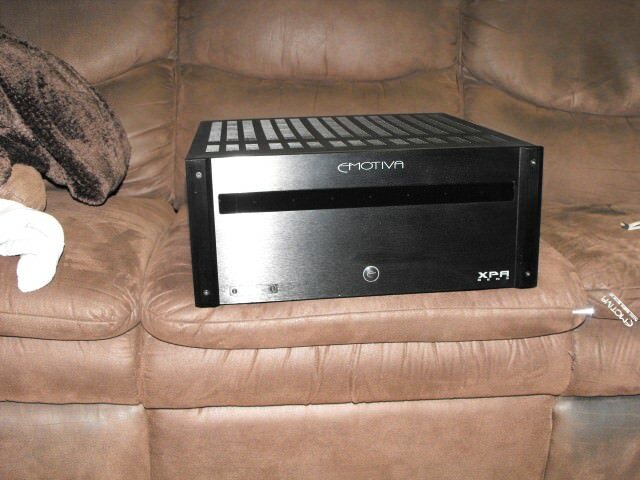 Those were my beginning with Axiom, fantastic low end for 2 channel full rangers or all rounder's. I have never heard any center of Axioms other than my V.P.160 V.4. After purchasing my M3s and M22s 5.1 days. Was trolling through many forums to "help" my decision making. Was using a Klipsch C20 the timbre was awful very shrill didn't complement Axiom for me. Found it annoying center stood out to much. Kept coming to the 160s style as being best woofer arrangement for off axis performance vs others. The 160 was also made by Axiom due to customer demand for this detail. So I decided to give the 160 a shot B stock Axiom has very high quality control if you get a good rating on a product, the blemish is hard to find. Since then have upgraded the rest of my setup to M80s,E.P.500 ADA1250 etc. Take your time with steps it's fun. Try an M3 as a center.